Playamo is a relatively new Multi-platform online casino for Australian gamblers to enjoy. It was established in 2016 and offers over 1000 games from several of the best game developers on the Internet. Our team has been hearing good things about Playamo Casino, so we decided it was time to put it through our stringent review process. Can Playamo stand with the best online casinos in Australia? Carry on reading to find out! 1st Deposit – 100% Bonus up to AU$100 + 100 Free Spins. Bonus Code: FIRSTDEP. When using these bonuses, players have a maximum bet limit of AU$5. As for promotional offers for existing players, Playamo has you covered with special bonuses. These include Friday Reload and Monday Free Spins. There is also a special high-roller bonus for players looking to deposit AU$1000 or more. The only issue we really have is the wagering requirement on all promotional offers, including the welcome bonus, is 50x. This is higher than many other casinos out there. Unfortunately, there is no telephone support, but with Live Chat and the contact form, players should always be able to get their issues resolved quickly. There will definitely be banking options to meet your needs. The games on offer is where Playamo Casino really shines. 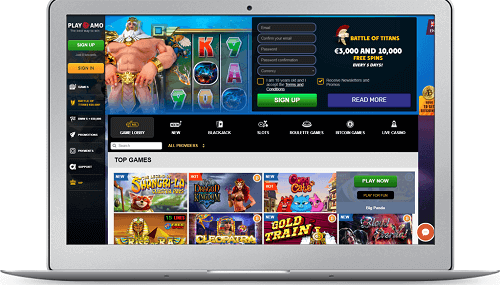 This is a multi-platform online casino that uses the world’s top casino game developers. These include the likes of Amatic, BetSoft, Microgaming, SoftSwiss, and more. This means there’s a massive collection of games on offer, with over 1000 games to choose from. Not only are there hundreds and hundreds of online pokies, but there’s a huge variety of classic table games. These include the likes of roulette, blackjack, baccarat, craps, sic bo, poker, and more! Players will also find multiple variants of the games mentioned, plus there are live dealer titles. The live dealer games come from Evolution Gaming, who are widely regarded to be the best live dealer developer in the world. If it’s casino games you’re looking for, look no further than Playamo. Playamo is an instant play online casino, meaning that players never need to download anything. 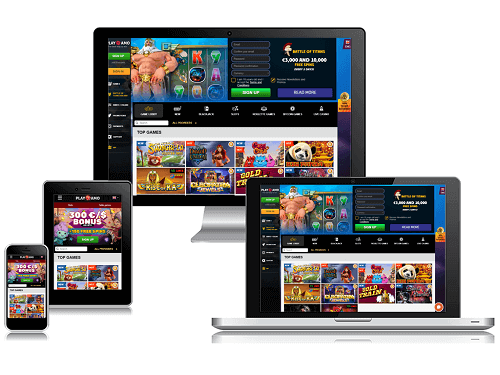 When it comes to mobile gambling, it means that almost any smartphone or tablet will be able to access the Playamo mobile casino and enjoy the massive game selection. Aussie players thinking about joining this online casino shouldn’t worry about fairness. The casino only uses the most trusted developers, whose games have been audited and tested for fairness multiple times. On top of this, the casino is regulated by Curacao, to ensure it treats players fairly. Finally, all transactions are protected by 128-bit SSL encryption, to make sure no unauthorised people have access to player’s private details. After spending a considerable amount of time reviewing Playamo online casino, the general consensus amongst our review team was that this is a fantastic casino online. There really isn’t much we can fault it on. The banking options are incredible, and it has one of the biggest game selections around. Not to mention the amazing live dealer games. Our only real concern is the 50x wagering requirement on the bonuses, which is higher than a lot of other casinos. Besides that though, this is a fantastic casino to gamble online at, and we highly recommend it to Australian players. It scores an impressive 4 ou of 5 spades!